This was a nice case of synchronizing display shots with crystal samples. Next time we can hopefully do it with a bit more complex display in order to better reveal the changes in crystals as the display changes. Two guys are needed in the field. Even three sometimes. It is great that you tried out cooperation during this display. I wonder how it would be if 7/8th Dec -type of display would occur...? In the distibution of tasks, I mean. Maybe a game of halocards would be needed beforehand to determine the tasks. 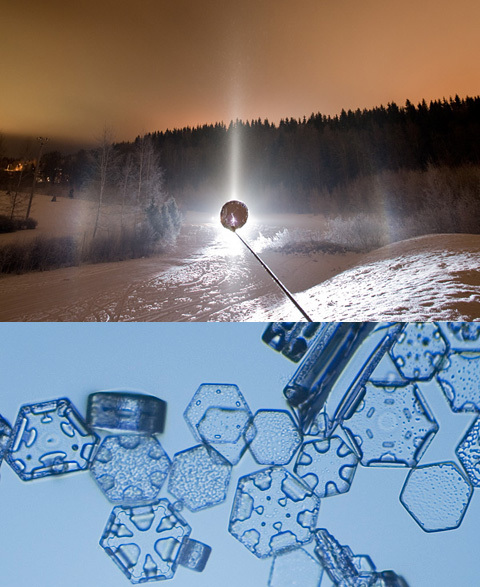 Fine set of crystal photos. Yep, the tasks would really have to be set beforehand in order to avoid any delay in the field. One just has to be fast fast fast. But I have a feeling that it would all play out beautifully. We also need someone to aim and switch the light sources in order to determine the differences in the beams. One to collect the crystals and one to shoot them. Perhaps we can hire a battalion from a nearby military base in order to overcome these problems. If I am around, I volunteer to be the crystal guy. Sampling a display like 7/8 December, where dish is full in 30 seconds, would be some task. One would need about 100 dishes, ready with liquid and lid on them. One dish is opened every about 30 seconds and at the same time the previous dish is closed with the lid and time written on it. Optimally, another person would perform the crystal photography at the same time. The microscope should have some cloth hanging on it to avoid contamination from the ongoing swarm. Third person photographs the display. If there was a fourth person, then up- and subhorizon photos could be taken alternatively, by lighting alternatively lamp up- and downhill. If there were more people, they should all work with the crystals. In halo phorography, more than one guy means problems: breathing clouds and shadows more likely spoil the photos then.